Posted on Tue 10 Aug 2010 at 10:11 PM PST. Filed under Recipes. In Greek rural places, the well known “spanakopita” (“spinach pie”) doesn’t have that much spinach in it. 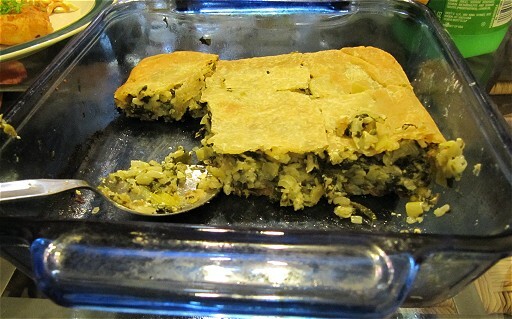 This is why we actually tend to call it “lahanopita” (meaning “leafy vegetable pie”), instead of “spanakopita”. Usually, villagers would put in it any green-leaf vegetable, wild or not, spinach-related or not. But of course, in the last 25 years or so, the Greek standard of living has gone high, and this recipe has gotten more civilized. Finding spinach is not so hard anymore. So, this is how we do this pie at the Epirus department of Greece. 1. Make the dough/phyllo, as shown in this video by my mother. In the video you will find both the recipe for the dough, plus the technique on how to shape the phyllo. Please note that for this recipe right here, you will need to use half the suggested dough ingredients. Finally, after making the dough, let it rest for an hour before making the phyllo with it. TIP: You can also make μπλατζάρα, which is the same pie, but without any phyllo. 2. Wash the leaves with cold water. In a big bowl cut in small pieces the onion, parsley, mint, leeks, spinach, sorrel/kale, and Swiss chard. Add some salt, and about 1/3 cup olive oil. Using your fingers, work the mixture, until they almost start lose shape (they start to look wilted). If there’s juice coming out of it (especially if you’re using thawed spinach), you must discard it. 3. Boil some water in a pan, and boil the rice for 3-4 minutes. If you’re using brown rice, boil for 6-7 minutes. Drain the water away, add the rice in the vegetable mixture. 4. 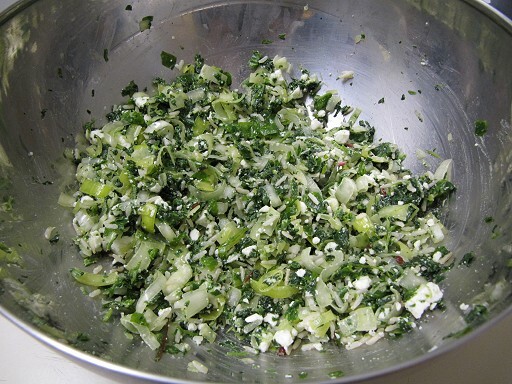 Crumble the feta cheese using your fingers, and add it to the mixture. Lightly mix all ingredients again. If the ingredients don’t look as in my first picture, you can optionally stir an egg in it. The egg helps the ingredients to get “glued” better together. Pre-heat the oven at 400 F (200 C). 5. Oil your baking dish. Place one of the phyllos on the bottom of the dish, add the mixture on top of it, even it out using your fingers or a fork, and then secure the whole thing with the second phyllo. Spread some more olive oil on the top of the phyllo. Using a fork make 3-4 holes on the fyllo, so it can “breath” while baking. 6. Place it in the hot oven, and bake for 40-45 minutes, or until the phyllo has started to get a nice brown color. At this point remove the dish from the oven, and let it rest for 2 minutes. Then, turn the pie upside down (technique is shown in the video linked above), and let it rest again for another 10 minutes. After that, it’s ready to eat, hot or cold. We had this pie tonight along some fried/battered catfish, and coleslaw salad. Tip: If you would like a bit more kick with this pie, lift the top phyllo, and pour a bit of lemon juice in the filling. It’s much better than just adding salt, as lemon goes better with it. I’ve been thinking about doing a video of our family’s pita recipe. It is very different then this one as we only use leeks for our vegetable. I’m afraid that my family will string me up though for putting the secret recipe out there for all to enjoy. Yeah, we call this “prassopita” in Greek (leek-pie), and it’s a bit different. There shouldn’t be any problem sharing the recipe though. Sharing should be the default behavior of people. 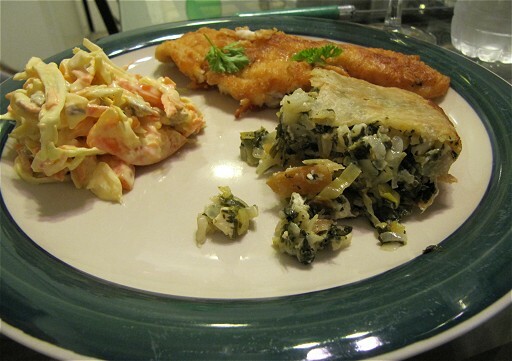 And did you make your own slaw too? You mix equal amount of Greek yogurt and mayo, fresh black pepper, and a bit of Tabasco. You then mix that with thinly cut cabbage, carrots, and a bit of bell pepper. You top it with sunflower seeds.